Bryant Park, which is behind the New York Public Library, is amazing! Over the last several decades, it became a cultural center in midtown NYC. This week I attended one of their art programs, led by an artist who was a Bryant Park Artist in Residence several summers ago. Marilyn and I, many years ago, became friends at an Everyday Matters course taught here by Danny Gregory, in NYC, and I enrolled immediately because of the limited size of these free classes. 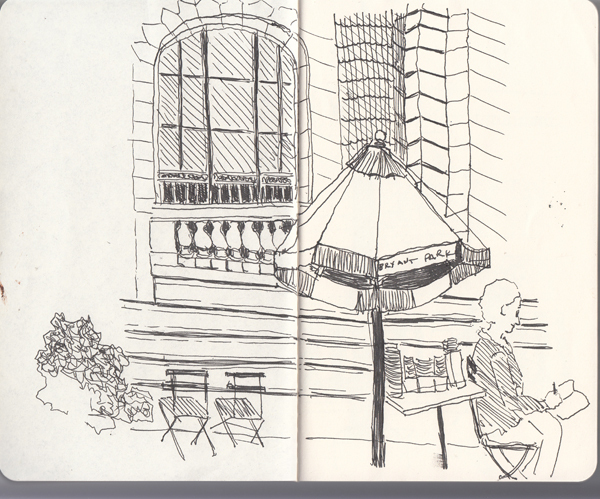 We met from 10-12 noon on Tuesday, Wednesday, Thursday and she gave each of us a Moleskine Cahier book and a Unipen - to be used for all of our sketches. 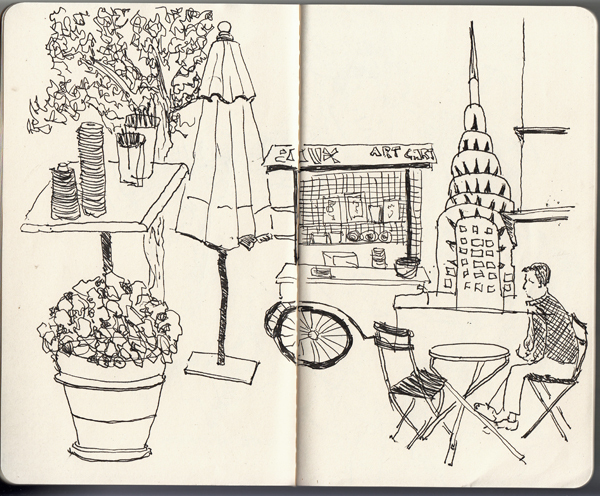 Day 1 - First Drawing: We were directed to select a small part of the NYPL front plaza and just draw what we saw. We had about 30-40 minutes for each sketch. Day 2 - Vignette: She led us around the plaza and showed us how she creates a quick vingnette of a space, selecting random things that intrigue her. 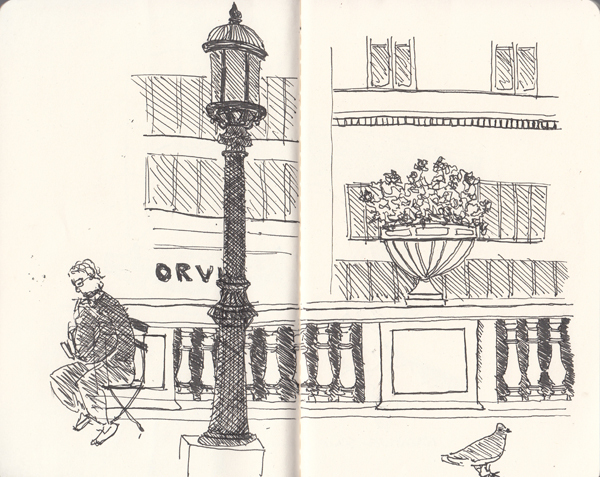 We then sketched our own vignette. 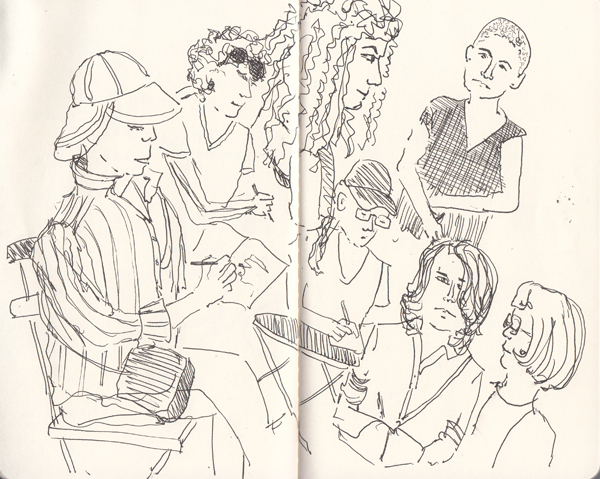 Day 2 - People: For our second drawing we quickly sketched each other. This was one of my spreads. 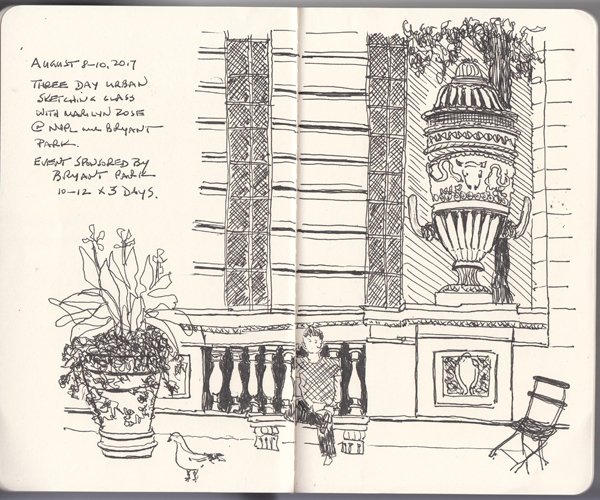 Day 3 - After some more instruction, we went around the Library to Bryant Park and sketched, while listening to the practice session of Broadway Show casts that were scheduled to perform in the afternoon. I had about an hour to draw, and then we returned to the Art Cart space in the front of the library and some students added color.